Recently, fashion's hippest souls have been going gray... on purpose. Perhaps taking their cues from natural silvers such as Jamie Lee Curtis, EmmyLou Harris, and Helen Mirren, members of the younger set are showing up on the red carpet with their own gray locks. Lady Gaga, Kelly Osborne, and Daphne Guinness are just a few of the lovelies asking their hairdressers for the gray treatment. And now the pinnacle of fashion itself, Vogue Magazine, is getting in on the act. 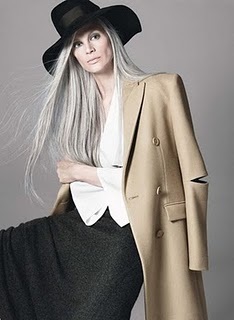 Vogue's August 2010 "Age Issue" features 40-something model Kristen McMenamy with hip-grazing gray locks. The 10 photos are nothing short of stunning. According to McMenamy, the gorgeous gray is mostly all her own. She says she decided to stop dyeing it 6 years ago and now sees colorist Josh Wood at Real Hair in London to match a black streak in the center of her hair to the rest of her natural silver. It's a refreshing turn of events to see today's women embracing natural hair in all its forms. 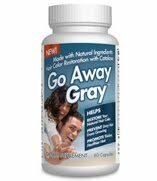 Gray is here to stay, so don't be afraid to grow your own. As Kristen McMenamy says, you can be gray and "still be rock-n-roll." First, we here at Longhairlovers not against hair extensions for people with hair loss or thinning hair problems. Weaves can be very helpful for people suffering from these conditions who otherwise wouldn't feel good about themselves. That said, we just can't stand to see a healthy young person sporting extensions in order to gain a couple of inches of length. Poor Brit-Brit was spotted out and about looking like THAT. I shudder to think about the tears these thousands and thousands of women are going to shed when their extensions grow out or are removed, only to reveal their own stubby, dry, broken off strands underneath. If you can grow your own hair, by all means, do it! Hair grows about 1/2" per month, so you really don't have to wait that long for at least shoulder-grazing tresses. Taking the fast path to longer hair will not only damage your own hair and scalp, it can possibly lead to permanent hair loss due to traction alopecia. If Britney's still not convinced, perhaps she should ask Naomi Campbell, who's showing her own signs of hair loss after years and years of wearing tight weaves. Head lice are just plain nasty and can turn your poor child into a social pariah. Even though they don't spread disease or cause serious harm, the little parasites are extremely contagious and can lead to itching and irritation. They also require that your child be kept home from school or camp until the problem is in check. 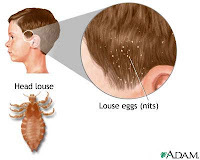 Past remedies for ridding the victim of lice has included carefully picking out lice eggs (nits) with a special comb, dousing hair in olive oil and covering with a plastic cap to suffocate the bugs, and applying prescription creams. All of these methods are messy and somewhat unreliable, since lice actually build up resistance to topical Rx creams and gels. If you get a call from camp or school saying your child has lice, ask your pediatrician about the drug ivermectin, brand name Stromectol. This anti-parasitic pill has been used to treat roundworm and has shown success in treating lice infestations. Out of 398 children given the drug, some 95% were lice-free two weeks later. Side effects include nausea and a rash, but children who participated in the study preferred the pill 7 to 1 over the traditional anti-lice scalp cream malathion. Ivermectin could be a mess-free way to rid your child of lice and get her back in the classroom fast. Be sure to discuss all of the risks and side-effects with your pediatrician first so you can weigh the odds of using a drug to wipe out the lice infestation. If you prefer natural methods, you'll probably be stuck with the oil-and-plastic-showercap trick. Natural for sure, but not likely to be popular with the kiddies. Naomi Campbell appears to be suffering from Traction Alopecia, a type of hair loss caused when the hair and scalp are pulled too tight for too long. Recent photos of the supermodel reveal hair breakage and loss around the hair line, which is a classic sign of the disorder. Hairstyles such as tight braids, twists, buns, ponytails, snug wigs, and the tracks that hold in hair extensions can be to blame. 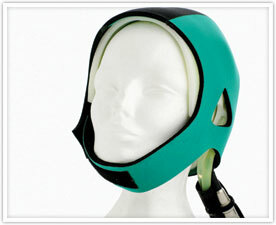 So can sleeping in rollers or other restrictive bedtime hair rituals. This type of hair loss can take years to become apparent and can be permanent. The good news is you don't have to give up your favorite hairstyle to avoid traction alopecia. Simply make sure you don't wear a restrictive style for more than a few hours at a time. If you wear hair extensions, try to go without for a few weeks at a time to allow your scalp to breathe. And be sure to practice scalp massage to ensure proper blood flow to your hair and scalp. Early signs of traction alopecia include broken hairs, redness and swelling around the hair follicles, small pimples, and scaling. If you suspect you're in the early stages of traction alopecia, stop wearing your restrictive hairstyle and see a trichologist or dermatologist for help. Forgo wigs and weaves and learn to love your natural hair! If you just can't do that, or need some hair pieces to disguise thin spots, make sure they're put in carefully and be sure to massage the areas of scalp where the wefts are attached. Remember that braids are only "protective styles" if you massage and moisturize the scalp. If you wear a ponytail or bun, take it down during the day and run your fingers through your hair to boost circulation before restyling. Any sign of breakage around the hair line should be a red flag that your hairstyle is too tight! All photos licensed by Longhairlovers.com, Inc.